If your Southwest home is in need of electrical or HVAC services, choose Omega Electrical & Mechanical Contractors. We are proud to be an El Paso family-owned business. Since we are licensed in both Texas and New Mexico, we’re able to provide electrical and HVAC assistance to the Southwest at large. But we’re much more than your regular run-of-the-mill HVAC team. We specialize in government and city contracts as well as residential and commercial work. At Omega Electrical & Mechanical Contractors, we are more than just a great electric company. 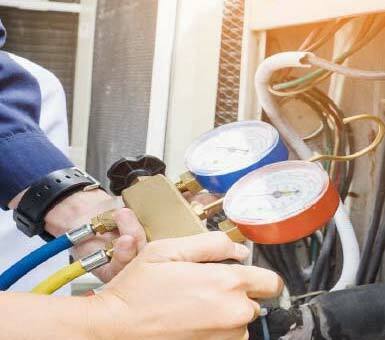 Our technicians are certified experts in electrical work, and we also provide heating and cooling services. If you need a conversion or just a brand new heating and cooling system, our experts can provide the prompt and professional service you’re looking for. The Omega team is made up of highly-qualified electricians who can tend to issues of any scale. Whether it be a residential or commercial concern, we can help. The Southwest area is well-known for its record-setting temperatures. Our repair services can make sure your home or business’s interior is cool and comfortable all summer long. Now is the best time to convert your swamp cooler to refrigerated air. Faulty swamp coolers can make the hot El Paso summers treacherous. If you’re tired of your unreliable swamp cooler, Omega Electrical & Mechanical Contractors can help! We specialize in refrigerated air conversions. Make the switch to a more reliable system, today! We conduct a wide variety of residential & commercial electrical services for your home. We are licensed to conduct refrigerated air conversions & installations in Texas & New Mexico. our experts can provide the prompt and professional service you’re looking for. No matter what you require, our experts can provide the service you need. We take great pride in the excellent residential and commercial electrical work we provide. No job is too small or too large for our team to handle. We can help with new and renovation electrical work. Our electricians offer some of the best craftsmanship in the Southwest region. We can help with security and surveillance systems, access control, fiber optic installation, custom lighting, and more! I have definitely noticed my electric bills are lower now that I have had a year with the solar panels Omega installed for me. They were very nice and professional when they installed the panels, and even fixed a roof leak on my one-year-old house at no extra charge. They care, and they do great work! I discovered Omega last July when looking for a new refrigerated AC system on the internet. I came across Omega’s reviews and was extremely impressed with what I saw. And then I had them install my new York AC unit. It runs great! And the service has been awesome afterwards too. They came out right away when an issue came up this last year, and fixed it right away. This is a perfect mix of skills…They have installed the HVAC units at both my home and business. And they have worked on circuit boards and a capacitor for me as well. They didn’t have to call a separate electrician when installing my Ruud refrigerated AC units…They ARE the electrician and HVAC experts! They are very reliable and do good work. We have had them do many HVAC and electrical repairs for us in the past. So we are having them install all the electical wiring and components in a major commercial center we are building on the east side. Call them, you can’t go wrong with Omega…a good solid company. We have been servicing the El Paso and New Mexico region for over 13 years. Our legacy lies in the long list of satisfied customers we have helped over the years. We have worked several government contracts, including renovating the living quarters at Fort Bliss as well as many other projects. Our electricians have also done plenty of residential and commercial work for the El Paso and New Mexico area. A large portion of our work comes from word of mouth from our happy customers. We strive not only to provide top-notch service but also excellent customer care. If you need electrical or HVAC systems installed into a new building or replaced in your current home or office, we can help. Omega Electrical & Mechanical is ready to provide the Southwest area with high-quality services. Give us a call today or schedule your next appointment on our site! We make it easy for home and business owners to achieve the electrical and mechanical services they deserve. Contact us today for reliable, trustworthy service!